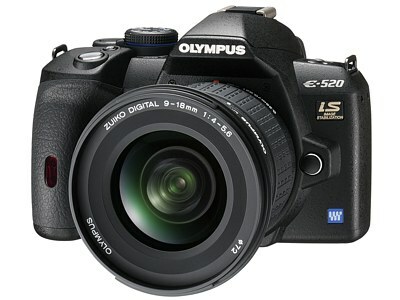 My other articles related to the Olympus E-System cameras. This article focuses mostly on similarities and differences between these cameras and the cameras they replace in the Olympus line-up: the E-410 and E-510 from a year earlier. Actually, both generations are so similar, that you may consider my reports on those a recommended reading before going any further. April, 2009: The E-420 just got a minor facelift, called E-450. Except for the addition of three Art Filters and three really very minor changes, it is identical to the E-420. The changes are described in my brief E-450 article; otherwise whatever I'm writing here is fully applicable to the "new, improved" model. It is this time of the year again: the time to release new camera models. The cameras introduced last year are water under the bridge: they are, of course, incapable of delivering any decent results (were you one of the suckers who believed they could be any good? ); if you want to take good pictures, you must get the latest, greatest. Or, at least, that's how most of the market feels. 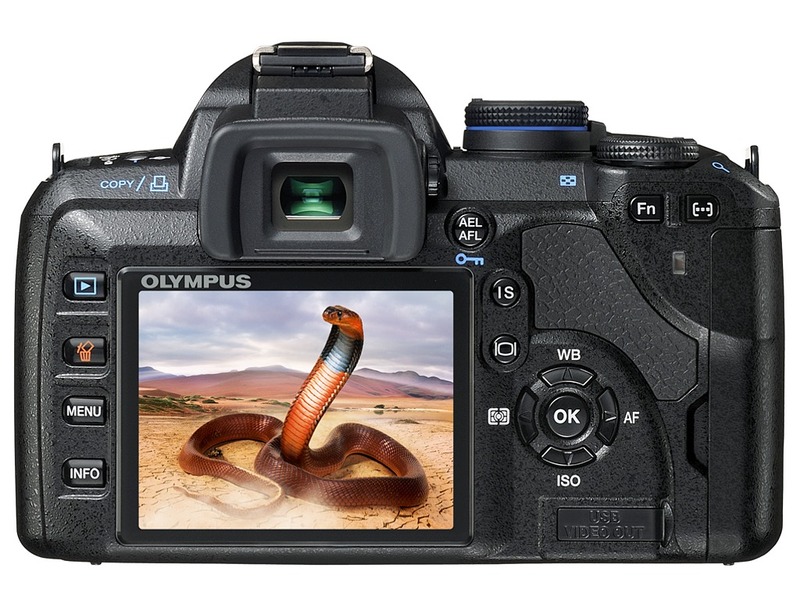 Last year Olympus released two budget SLRs, the non-identical twins: the E-410 and E-510; outside of the form factor and slight differences in controls, the cameras differed only in one important piece of specs: the E-510 has body-based image stabilization. They have been described in my Class of 2007 article. Both turned out to be very capable cameras, quite able to satisfy even a demanding amateur photographer. That, combined with very attractive prices and an extremely nice choice of Four Thirds lenses, resulted in strong sales and many satisfied converts to the Olympus camp. Now, I am not going to delve into listing all features and settings for these two cameras: in addition to being almost exactly like their predecessors, they are also very much like each other. If you are new to Olympus SLRs, start from reading my E-510 Review and Reference, which is almost fully applicable to both models of 2008. The few differences are summarized in the table below. (475+75+12g) The top value includes battery and memory cards (itemized below). Body size (W×H×D) 130×91×53 mm 136×92×68 mm 130×91×53 mm 136×92×68 mm The last dimension (D) really describes the grip depth. Autofocus in Live View Uses "regular" AF sensors (mirror flap) Uses the imager (contrast detection) Combination of both modes possible in x20 cameras. Sequential shooting rate 3 frames per second 3.5 frames per second A small but noticeable increase. Image stabilization No Body-based No Body-based This is the main difference between the 4x0 and 5x0 lines; see also remarks below. Face Detection No Yes, in Live View only Rather useless, especially in Live View. (ISO 100) 10 m 12 m 10 m 12 m GN 12 provides about 40% more light than GN 10. (10.8Wh, 75g) The Wh rating describes the total energy stored. 41×55 mm The resolution remains the same: 77,000 pixels or 230,000 RGB dots. Direct controls Simplified Full Simplified Full "Simplified" does not mean "worse". The changes (all of them improvements) from the 2007 models are few and identical for both the E-420 and E-520, as measured from their respective predecessors. Risking some repetitiveness, here is a list, with my comments. Slightly heavier bodies: the differences are hardly noticeable, just 5 g for the E-420 and 15 g for the E-520. For the former, I could attribute the difference to larger monitor; in the '520, there must have been some internal mechanical refinements to explain the remaining 10 g. Not that you would notice. Larger LCD display. This is the only non-cosmetic difference visible from outside; the new monitors are 4 mm wider and 3 mm taller than old ones. The 8% increase is not revolutionary, but visible (I wish this had happened to the optical finder size! ), and it will make a difference for some (not necessarily middle-aged) users. The monitor resolution remains unchanged at 320×240, or close to 77,000 pixels (or 230,000 individual RGB dots, which some manufacturers misleadingly refer to as "pixels"). The increase in monitor size has been achieved without any re-arrangement of the controls at the camera's backs, just at the expense of the spacing between monitor edges and the neighboring buttons, as shown in the pictures below. The back sides of the E-510 (left) and E-520 (right). Note also some cosmetic differences: different shape of the rubber USB/Video port cover (bottom right), new (nicer!) styling of both dials on the top, and a change from green to blue in some button markings. For some users, the changes in dial shape are not just cosmetic: underwater enclosures designed for one year's model will not work with the other's one. The sequential shooting rate (maximum, assuming no delay due to slow shutter speed or AF) has been increased from 3 to 3.5 FPS. The sequence length (buffer capacity) remains unchanged at 8 raw frames, 25 or so 1:2.7 JPEGs, more at higher compression. Shadow-enhancing gradation curve (often referred to as "shadow enhancement technology", as this sounds way better and more serious). This really is a new Auto setting in the tonal gradation curve selection (in addition to Normal, High Key, and Low Key. The feature was also present in the E-3, and it is nothing big: just adjusting the raw-to-RGB tonal transition curve. Shadow enhancement does not affect the RGB matrix information taken off the sensor (and stored in a raw image file, if you decide to go this way). It is only applied during the raw-to-RGB conversion, where the tonal curve is raised in the low part (shadows) at the expense of less contrast (or range) in mid-tones and/or highlights. Nothing however, comes free. Look at an example of the same technique used in postprocessing (almost any program will allow you to do that). Here the first 10% (to the left of the leftmost dot, approximately) uses about 20% on output. Yes, we are opening up the shadows, but also doubling the shadow noise, in terms of luminance amplitude. Then, the region up to the second dot (lower mid-tones) gets only 30% of the total range instead of the original 40% — reduced contrast. Depending on the scene, this may or may not bring the desired effect; that's why with the E-3 I preferred to leave this feature alone, and apply tonal correction (oops! "Shadow Enhancement Technology"!) in postprocessing, if needed, with more control over it — even when starting from a JPEG file (as opposed to raw). The Auto gradation setting in these cameras does not affect just the shadows; the luminosity histogram indicates that the highlights are also affected (the curve part beyond the rightmost dot brought a bit down). While this does not change the available dynamic range, it makes "almost overblown" highlights "less almost overblown". Tweaks to the imaging pipeline? This is always possible in the new version of a camera, but Olympus is not specific on this subject. While hinting that new cameras have a modified version of the sensor, they are not quite clear on that. The claimed increase in dynamic range delivered may be true (i.e., happening in the captured signal), or just due to tweaked contrast curve in raw-to-RGB conversion. The new sensor features an improved dynamic range to ensure richer, subtler gradations, giving images a natural, true-to-life appearance. The dynamic range measurements performed by DP Review show that range to be 0.9 EV (exposure factor of 1.9×) wider in the E-420 than in the E-410, a visible improvement, but still below the capabilities of competing models (Sony A350: 0.4 EV more; Canon 450D: 0.5 EV more; Nikon D60: 0.8 EV more). Remember that the same-year E-5x0 cameras share the imaging circuitry with their E-4x0 siblings, therefore these results should be also applicable to them. While higher dynamic range is always a desirable feature, I would, again, have to try a 2008 camera against its 2007 equivalent in the same conditions, with identical (metered manual) exposure, to say how important is the change in practical use. Remember that a greater dynamic range does not automatically protect you from blown-out highlights; it is the proper use of exposure compensation which does. Some early E-420 users report that the noise filtering is less intrusive in this model than it was in the E-410, especially for ISO 100. This, actually, would be good news. Then, the degree of adjustment in image sharpening also seems narrower than on the older camera. Such tweaks are a matter of firmware modification, and are usually a product of heavy deliberation by the designers; I would just hope that they know what they are doing. [...] examination of the raw output leads us to conclude that Olympus has increased the strength of the anti-alias filter on the sensor since the E-410, something we also noted when reviewing the E-3. This filter, intended to prevent raw-to-RGB conversion artifacts, also reduces slightly the resolution of the optical image reaching the sensor; the image becomes softer. It was noticeably less intrusive in the E-410/E-510 than in the earlier E-500, and I liked that a lot. This is possible, although the method used in the review cannot separate between the effects of the lens quality, anti-aliasing filter, and image processing. Still, I've performed dozens of comparative series of shots with the E-510 and E-3, both side by side and swapping lenses, and I didn't have complaints about softness of images from the latter. If the results from the new cameras are remindful of those from the E-3, I'm not worried at all. Improved menu system. The best things about Olympus camera menus is that you do not have to use them often; all basic settings are accessible either by direct buttons (fewer of these in the 4x0 models) or via the on-screen Control Panel I like so much. Still, in the '2008 cameras the menu system (more exactly: the two Settings menus) have been re-worked extensively; now they are almost identical to the Settings menus in the E-3. For more, see my E-3 menu comments, 100% applicable to the new cameras. In particular, my improvement suggestions listed there still stand. Imager-based AF. With this option activated, the camera will use the imager to adjust autofocus when the shutter is half-pressed in Live View. This is the contrast detection method, slower and less accurate than phase detection, in which the "real" AF mechanism (using dedicated sensors below the mirror) is based, but it does not require flapping the mirror down and back up in the process. That method is still available upon a press of the Lock button. More, a hybrid mode can be set, where contrast detection is used during the live preview, but the final adjustment is done just before the picture is taken, with the AF sensors and phase detection. This makes focus adjustment (for viewing purposes at least) more convenient and faster in the Live View mode, but it is hardly a ground-breaking feature. It actually makes your SLR work like a non-SLR camera, forgoing the SLR advantages of faster and more accurate AF (not to mention the advantages of optical viewing). Note that imager-based Live View AF works only with a few lenses; at this moment these are the 14-42 mm F/3.5-5.6 ZD, 40-150 mm F/4.0-5.6 ZD (both sold within a kit with either camera) and the "pancake" 25 mm F/2.8 ZD (also sometimes bundled in). The former lenses may require a firmware update to provide this functionality. I suspect this is because in the "regular" AF the lens' servo system knows how to process a "move by this much" request from the body, while in the imager AF it also has to handle a "keep moving until I tell you to stop" one. Just a guess. Face Detection (Olympus refers to this as Face & Back Control, but this is not what you may think). Because this is limited to the Live View mode, I consider it to be perhaps the most useless "enhancement" possible for an SLR (feel free to disagree). Using spot metering and AF gives the photographer more control and precision. Anyone who thinks this is useful should rather buy a point-and-shoot camera with this feature. This function assures beautiful portrait or group shots, in which both the faces of the subjects and the background are clear and sharp. And, stupid me, I always thought you can't do anything here without enough depth of field (assuming you do want to have a sharp background). Looks like the marketing people are so much smarter than any engineers! Well, at least the face (and back!) detection does not interfere with any other features; all it takes is one slot in the camera settings menu. The Perfect Shot. Another dubious (see: I can watch my language; not a single "moronic" in this text so far, although I'm very tempted now!) gimmick, available only in the Live View mode. Instead of one preview the display shows four tiny thumbnails at a time, differing in adjustment values of one parameter (like exposure or WB compensation), and you can switch from one dimension (i.e. parameter type) to another. This is much less useful than it sounds (putting aside that it works, obviously, only in Live View). You cannot judge subtle differences in white balance by tiny thumbnails, especially in daylight, when the screen is barely readable. After all, maybe I was wrong choosing Face Detection as the most, hmm..., useless feature on these cameras? To save you going through my E-510 write-up, here is a brief summary of the basic features shared by both the "old" and "new" twins. A ten-megapixel NMOS sensor, made by Panasonic, with the native RGB image resolution of 3648×2736 pixels (4:3 aspect ratio). The effective image size on the sensor is 13×17.3 mm. In case you've heard how much "smaller" the Four Thirds standard sensor size is as compared to competing models from other manufacturers, see here. 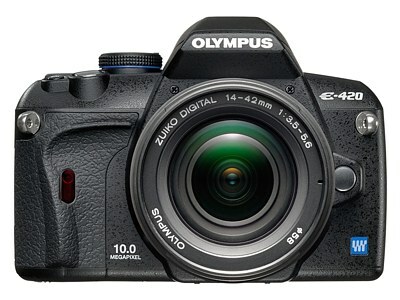 The sensor, first introduced in the E-410, has proven itself quite well, preserving what many people refer to as "Olympus Colors". JPEG and ORF (Olympus Raw Format) file support. Notably, the lowest JPEG compression is 1:2.7; at this ratio compression artifacts are virtually nonexistent. This is, for me at least, a major advantage as compared to competing brands and models. Live View: with the mirror up and shutter open, the LCD monitor can be used for live preview. This makes your SLR work very much like a $100, entry-level model, but can be useful in some situations — like, for example, table-top applications, astrophotography, or infrared. The last time I've been using Live View on my E-510 was about six months ago. The enhancements to the Live View introduced in the new cameras will be discussed in the next section. Full "High Speed" USB-2 PC connection, with the camera acting as a storage-class device, i.e., seen by the computer as an external drive. If you take this for granted, try it with a Canon SLR (I am not sure; maybe they've introduced that in the 450D, or maybe not!). 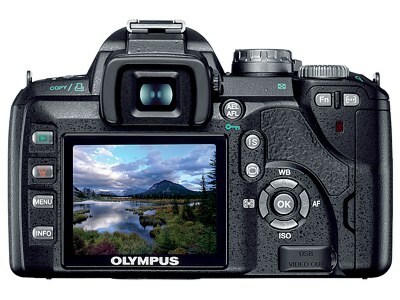 Three-sensor autofocus (can be switched to one), central sensor (only) being cross-type. Really, I would prefer just one sensor, cross-type, and as sensitive as it is possible. Just recently, while birding at 300 mm, with a very shallow depth of field, I thanked Olympus again for the option to use just the central sensor. I really do not want the camera to decide where in the frame to focus! The optical finder in all models has a magnification of 0.92× and coverage (linear) of 95%. While the apparent finder size is quite small, it is not really smaller than in other brand's cameras in this price range. These (with a 3:2 aspect ratio) cover more in the horizontal dimension, which is in most cases cropped out to bring the image to one of the "standard" formats. In the more meaningful vertical dimension, these Olympus cameras actually have about 1% of an advantage over the Canon 400D (or a similar disadvantage versus the Nikon 40D and its siblings). Only when you go up the price scale, to cameras like the Nikon D300, Canon 40D, or Olympus E-3, the differences start being visible. For comparison between some models, see here. ISO 100 to 1600 range of sensor gain. ISO 400 is safe to use in most applications (at the expense of unavoidable narrowing of the dynamic range); ISO 800 is still presentable, but even ISO 1600 may bring passable results, especially when used with an external application for noise removal. High ISO performance does not seem to be improved in new models. It also remains unclear if the banding problem, showing up occasionally in the E-510 and E-410 has been addressed. Still, with those cameras I've got some quite pleasing shots at ISO 1600. Adjustable noise filtering. If you like to see your images wrapped in Saran, go ahead, dial this up. If, like me, you are not allergic to moderate amounts of noise, but would like to see some stunning detail, dial this down. I like this feature a lot. Ultrasonic dust cleaning system. When Olympus first introduced it in 2003 (E-1), other makers dismissed a need for this feature; now almost all offer it in their models. Still, according to the only comparative study I'm aware of (done by Róbert Irházy of PixInfo.com), the Olympus solutions works best. Dual card slots: Compact Flash and xD Picture. While I like the option to use two cards, Olympus still insists on using their (almost) proprietary xD ones in one of them. The xD is the least common, slowest, most expensive, and (probably) least reliable card standard on the market, and the newest "M+" flavor is actually slower than xD "H" cards from 2006, no longer in production. (See here for more on this, if you think I'm too harsh.) What does it take to call it quits? The excellent Control Panel remains virtually unchanged. There is no need to access the dreaded menu system for any adjustments of shooting parameters (with one unfortunate exception). The only addition is the Face Detection indicator; this space could be better used to add access to exposure bracketing (still missing). The E-510 and E-520 share one feature omitted on their E-4x0 siblings: body-based image stabilization. In my book, this is preferred to the lens-based one, as it works with any lenses, including legacy ones (i.e., those designed for other cameras and used manually through a lens adapter). According to my measurements, image stabilization in the E-510 provides, indeed, some gain in handholdability: from about 1 EV at the focal length of 14 mm to somewhat more than 2 EV at 150 mm (probably more at longer focal lengths). Unfortunately, these are the only results I can trust, and comparisons with any other camera models are meaningless; so are numbers seen in various publications (including, but not limited to those provided by manufacturers). For more on my results and the method used to derive them, see my E-510 Image Stabilization article. The new E-520 introduces one change compared to its predecessor: it allows to perform IS in two dimensions, or in either of them. The E-510, in addition to the former option, allowed only for IS along the shorter image side. The newly-introduced second dimension option may be helpful in vertical panning (or horizontal panning with vertically-oriented camera). 14-42 mm F/3.5-5.6 ZD — recently the Olympus "standard" economy zoom. Compact and lightweight, plastic mount, but surprisingly civilized performance. For more on this lens, see lens remarks in my E-510 review. 70-300 mm F/4.0-5.6 ZD — again, much better than the price and weight/size would indicate (see a separate review). As any long telephoto (up to 600 mm Equivalent Focal Length! ), this is not a lens for a casual user, and I was a bit surprised to see it bundled with the E-520 body. 25 mm F/2.8 ZD — the Olympus non-zoom "pancake" lens with the most traditional "standard" image angle (50 mm EFL). Just 24 mm long, it makes the E-420 actually pocketable (assuming you have large pockets). Assuming the expected optical quality, I would consider this lens sensational at F2.0. At F/2.8 I still like it (without having used it yet), but it seems way overpriced. This is one lens I would expect to drop in price when the novelty wears off. The first, most common, two on this list are priced very aggressively when bundled with the camera. My advice is to get them even if you plan to use other, more expensive lenses on a regular basis. I can well imagine traveling with the 12-60 mm ZD, carrying also the 40-150 mm ZD as a lightweight alternative for the rare case a longer focal length is needed. 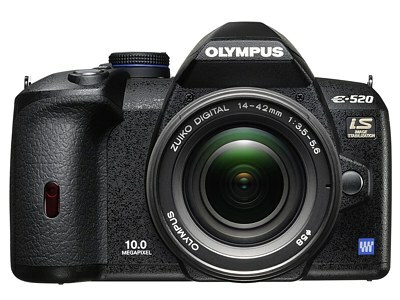 Just for your entertainment, here are two more product photos of the new Olympus body with economy-line Olympus lenses. Note that adding these two lenses to the "basic" kit (14-42 and 40-150 mm ZD) covers an impressive focal length range of 9-300 mm (equivalent to 18-600 mm on a full-frame 35-mm camera) at the total expense (including body) of just about $1500 and the total weight (ditto) of less than 1.9 kg (4 lb) — quite a feat! 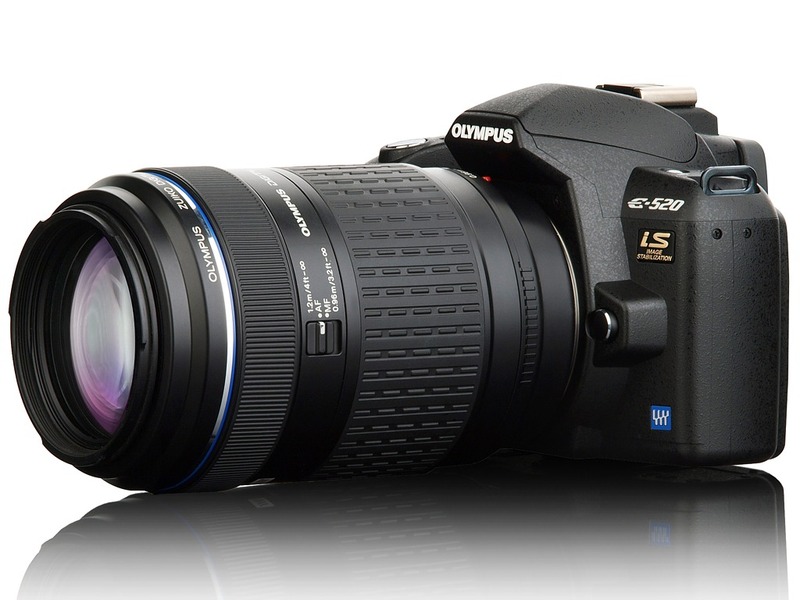 If you are new to Olympus SLRs, here is some general lens info. If you are familiar with the subject, just skip this passage. These cameras follow the Four Thirds standard, defining the sensor size and lens-to-camera connection (mechanical and electronic). At present, 32 such lenses are available (with a few more expected in the coming year), mostly made by Olympus, but also by Sigma and Leica/Panasonic. Some of the Olympus lenses are among the best in industry, and not all of these are exotically priced. In particular, the 12-60 mm ZD and 7-14 mm ZD are hard to match on any platform, while still priced for us mere mortals ($900 and $1500, respectively, in the U.S.). The 50 mm Macro ZD is one of my personal favorites for close-ups and portraits, at the most attractive price of less than $400. To compare focal lengths between different frame formats, you must use a focal length multiplier. For conversion from Four Thirds (Olympus) to 35-mm full frame, a value of 2.0 should be used. This means, for example, that a 14 mm lens on an Olympus SLR provides the same (diagonal) image angle as a 28 mm on a 35-mm full frame camera. To convert from Olympus (FT) to APS-C (Canon), use a value of 1.23. For example, a focal length of 14 mm on Olympus provides the same angle as 17 mm (1.23×14) on a Canon APS-C camera. From Olympus (FT) to APS-C (Nikon) a.k.a. DX: 1.31. For example: 14 mm on Olympus is the same (diagonally) as 18 mm on Nikon. The comparison is additionally complicated by the fact that the Four thirds format has a 4:3 aspect ratio, while all others listed here — 3:2. To compare the vertical image angle, a values slightly smaller than those shown should be used; for the horizontal angle — slightly larger. The E-420 lacks the (body-based) image stabilization. The Digital Image Stabilization listed in some promotional materials is not image stabilization, but a mode in which the camera just raises the ISO setting to use faster shutter speed. The E-420 uses a smaller and lighter battery of less capacity (by 25%). The E-420 body is slightly smaller (not just the battery grip!) and lighter (by 22%, nothing to sniff at if you like traveling light!). The E-420 has fewer external controls (buttons, or button function assignments). The E-420 is missing some of the adjustments present in the Settings menus of the E-520. Yes, this is all! Putting aside image stabilization, both are virtually the same camera. The first three items in the list do not need more comment; the last two are discussed in the next section. E-420 — dumbed down, or streamlined? This depends on how you look at this, but I'm leaning to the latter interpretation of the E-420 user interface simplification. First of all, the external controls. 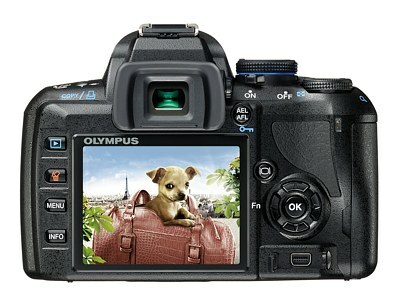 Obviously, without the image stabilization functionality, the E-420 does not have the IS button. It has, however two other buttons removed: the ones dedicated to a user-assigned function, and to the choice of the AF point (both placed at the top right in the E-520). I'm not missing these two: most of the time I'm using the central AF point only, and the user-defined function can be assigned to the left-arrow button on the E-420. The E-420 (left, port cover open) and E-520 (right) back controls. Another change: the arrow buttons, used in the E-520 also to access directly ISO, AF mode, WB, and metering pattern), in the E-420 serve just as arrow buttons, for screen navigation and nothing else. Outside of the preview mode, they serve no function, which makes the interface more consistent (or less modal). The functionality of removed buttons (or of secondary button modes) must be accessed in this camera through the Control Panel, which is not really slower or more complicated than doing it directly — with one exception: getting to the operations assignable to the Function button (like, for example, reference WB metering or DoF preview). This is why the left arrow button can act as the Function one, even if it is unmarked. A reasonable decision. The second group of omissions in the E-420 includes some of the items in the Settings menus. True, the camera does not provide access to some user preferences available in the E-520, but in all cases the designers chose reasonable defaults. Most of these choices do not exist at all in competing cameras in this class, and I'm not missing them; in exchange, the settings navigation has been considerably simplified. In general, I do not consider the E-420 to be "dumbed down" in this aspect. Simplified or streamlined, yes; largely a matter of taste. If you do have an E-410 or E-510, the new models are not a compelling reason for upgrade. The improvements are few and of rather secondary nature: not enough, in my book, to justify a new expense. Better add another two or three C-notes and treat yourself to the 12-60 mm ZD lens for your camera, or extend your focal range with the 70-300 ZD (only if you really need it! ), or, even better, wait to try out the upcoming 9-18 mm ZD. Each of these options is more worthy of your hard-earned money. Users of the older E-500 may (but do not have to) consider the upgrade. That camera still delivers nicely in today's terms, and you should be happy with it for at least another year or two (unless you have to have image stabilization). All depends on how much spare change you have. If you are using the E-1, then probably you will be better served by the very capable, pro-grade E-3, unless the camera is too big and heavy for your today's needs and taste. In such a case, you should not be disappointed with the E-520 performance, and only now, with the 10 MP matrix, you will see how much detail does your premium E-1 glass really resolve. For a new buyer (a newcomer to digital SLRs or switching from another system), both the E-420 and E-520 are worth consideration. Both offer very good image-taking capabilities and build quality in a compact package at an even more compact price (compared to what you get), with a very wide range of customizability and picture-taking options. The body-based image stabilization (E-520) really works, and so does ultrasonic dust cleaning. The included kit lenses are surprisingly good for the price, and buying into the system gives you an access to a very attractive and complete lens line, ranging from modestly priced (yet respectably performing) offerings to some cost-no-object ones. Evolt® and Olympus® are registered trademarks of Olympus Corporation.